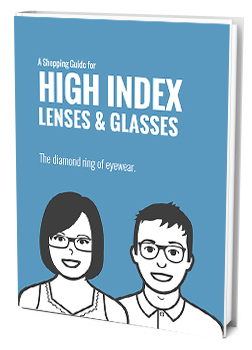 You Are Here: Home » High Index Lenses » What is a Polycarbonate High Index Lens? What is a Polycarbonate High Index Lens? Polycarbonate high index lenses are a bit of a paradox. The refractive index of polycarbonate is about 1.58, but most optical professionals nowadays consider 1.60 to be the lowest refractive index that can be called “high index”. So what does this mean? Do polycarbonate high index lenses exist? The straight answer is no, but the long answer is: they used to. As high index lenses have matured, polycarbonate was kicked out of the high index category and moved into a “mid index” category, which is between standard plastic and high index. Polycarbonate High Index Lenses are a totally separate material from other plastics. Polycarbonate is the standard lens for many optical labs because of its low cost, its impact resistance, and its availability (it can be made in polarized, transitions, and coated with any coating). Not high index. High index lenses have a refractive index (ability to bend light) of 1.60 or higher. Since polycarbonate is 1.58 index, it is considered a “mid index” lens. Standard plastic lenses are around 1.48, so polycarbonate is a good, inexpensive alternative to standard plastic lenses if you do not have a very high prescription. But there is no such thing as high index polycarbonate lenses. Very impact resistant. If you are buying your glasses to be used in some sort of safety application, polycarbonate is a good choice. Very easy to scratch. While poly is extremely impact resistant, it is also very easy to scratch because the material is relatively soft. High index plastic is much more scratch resistant than polycarbonate, so in normal glasses you can expect high index to have a longer life than poly. Inexpensive. High index lenses are more expensive than polycarbonate, but there are no polycarbonate high index lenses. So if you are looking for cheaper lenses, poly may be a good choice. Just know that, if they get scratched, you may be purchasing new glasses sooner than if you’d gone with high index, effectively negating the money you saved originally. A lens that used to be considered high index. This is why the term high index polycarbonate lenses is still floating around. Back when high index lenses were relatively new, they didn’t get much higher than 1.67, so the “high index” category still included 1.58. Nowadays, high index lenses can go up to 1.80 or even higher, so the categories have shifted. It’s still pretty common for people to search around for a high index polycarbonate lens, and the most common reason is that they’re actually looking for a high index plastic lens. Other people search for polycarbonate high index because they need polycarbonate, but they think that “polycarbonate” and “polycarbonate high index” are synonymous. Hopefully, this removes some of the confusion while you’re shopping for eyeglasses and comparing lens materials. In general, we recommend high index over polycarbonate for its longevity, thinness, and lightness.